Discussion in 'Colored Gemstones' started by D&T, Jun 30, 2009. That sounds like an exciting project! Where did you find the rough? I have never had anything cut on commission. The results certainly are awe inspiring! The cutter himself showed me this rough. He wasn’t about to cut it but I practically made him!! Since I have had one neon tourmaline I just couldn’t pass up the chance to have another so even the rough was a bit included I decided to take the risk and get it cut. However I have bought rough myself from groups on Facebook and then gotten it cut too. Here the risk was a bit bigger because I picked out rough myself and that too online. I bought 5 blue green pieces of tourmaline rough , one isn’t done yet but the other four came out really well. Here are some pics. I guess what I mean is, it’s totally worth it and if you commission it and the result turns out to be great, it’s often better than you or the cutter expected and you end up getting a great deal too. chatoyancy, MissyBeaucoup, lovedogs and 3 others like this. Good thing that you saw this beautiful Camellia ring first, or it would have been mine Congratulations to you on scoring such a beautiful piece! How gorgeous, that color is TDF and the setting is beautiful! Congrats! Thank you so much. I’ll post pics very soon !! I’m very excited to say I managed to buy a great ring from LT. It’s one many of you may recognise from long back. It belonged to Katharath originally who sold it couple of years ago and then that person listed it. She worked with Yvonne on this one and never having owned one of her creations I’m very excited to receive it. I’ll get it on Monday because the seller was kind enough to ship it via FedEx. Wow! This ring is to die for . You had great timing to see it on Loupe Troop and purchase it so quickly. I have admired Katharath’s collection too - she selected the most amazing Mahenge Spinels. Can’t wait for you to receive it! Hey @elle_71125 I took a few pictures. The weather wasn't that great, so I haven't taken pictures of my entire collection, but thought I would share what few pictures I've taken on my new camera. It is lightly included to moderately included. With the new camera you can make out the little dark specks toward the center of the ring and the dark streak close to one of the prongs. I think I scratched the surface diagonally (bumped my hand against the fridge pretty hard a couple of times within the first couple days of the engagement), or else it came like this, but the color hides it well. Because I was also wearing my green sunflower ring, I also took one of that with the digital camera. Finally, I wanted to show off the pink tourmaline I bought from @Rare gem lover earlier this year, set into a silver solitaire setting as a gift for my future mother-in-law's birthday, which we celebrated on Saturday. chatoyancy, natasha-cupcake, leslie1956 and 6 others like this. Your ruby e-ring is gorgeous! The new camera makes all the difference in the world. And this pic of your sphere is great! I already loved it but this just made me love it more. MissyBeaucoup, lovedogs and voce like this. @voce wow it looks fantastic! Those prongs give it so much structure. How did she like it ? Also I’m dying over your sphene ring!! Thanks! For the compliment and for the gem to begin with . Her favorite color is pink, so I figured it would make a great birthday gift for her. She LOVED it!! Hugged me multiple times and showed it off to everyone. It has now replaced the opal ring she wore on that finger before. You can easily order your own sphene ring from Yvonne if you want. Her setter is one of the best. LOL @ trigger happy behaviour paying off. It seems as though more of us have regrets from not pulling the trigger than from pulling the trigger. I think you're very smart to gamble on rough, instead of waiting for the cutters to decide what to cut. Thank you so much. I’ve been gambling about lately and happy it’s kind of working. Super happy she loved it and I’d really love to know who did the silver setting. I like the prongs. As for the stone it’s actually from @LisaRN !! It’s awesome how these stones just circulate within the community and land up where they do . She has a great eye for pink so all credit to her really! LisaRN and voce like this. That 9mm-20mm setting I was originally going to use for a peridot, as I had purchased a simpler prong setting from the same seller for 8mm round for the pink tourmaline, but that one was too shallow. I showed this one to the local jeweler and he said he can fit the pink tourmaline in that one. 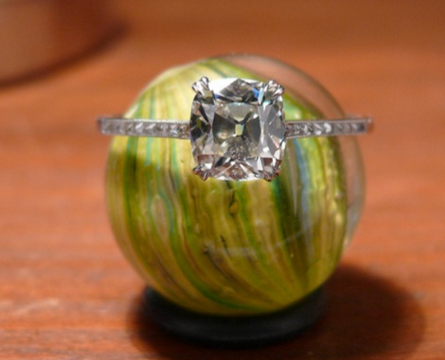 So like $12 for the setting itself and $50 to the jeweler to set it. The jeweler told me the setting needed to be polished, since some of the edges were rough from the casting. Anyway, I'm happy with the result. I was at first planning to set the stone myself, but changed my mind after getting the settings in the mail. Once I get back from traveling (2 weeks) I will have Yvonne mail me the fire opal I bought from her. I'm going to try setting a couple of 3mm Mexican fire opals with the 5mm blue-green tourmaline from you. Received the ring! Although I love the centre stone (it is just gorgeous) I don’t think the yellow gold and red combo suit me at all. Uh oh! chatoyancy, leslie1956 and Rfisher like this. That sounds like an amazing combination! Wow I would have never thought of it. Do you have a picture of the fire opals? Thanks for sharing the link for the silver setting! I’m always on the look out. Wow!! I love the results!! The color is really beautiful. Your risk taking —combined with a good eye—definitely paid off. Thank you so much hope you’re loving your green tourmaline. It came from the same source as these! @voce What a beautiful engagement ring! I absolutely love the ruby and setting. It looks perfect on you and I’m impressed at how your new camera picks up the glow. Bless you for being such a sweet and thoughtful daughter-in-law to be. I hope you have a joyful family life always! voce and Rare gem lover like this. I think it looks lovely on you! I would never see that picture and think it doesn't suit your skin tone. Please keep it a while before you decide to disassemble the ring or re-sell. Although I don't think you'd have a problem finding a buyer! voce, MissyBeaucoup and Rare gem lover like this. Have decided I need a new camera. voce and MissyBeaucoup like this. Thank you for your kind thought. I just had such a strong reaction to this ring. I tried to convince myself all day I like the setting on me but the yellow gold and the halo just doesn’t suit my taste in person so I listed it. But it’s worth considering a while... I guess I was in a hurry! Thanks I’ll keep your advice in mind. @elle_71125 @MissyBeaucoup @Rfisher thanks for the compliments! Yvonne has two different colors for fire opals, and this was the type I bought. MissyBeaucoup and elle_71125 like this. It's such a shame you had that strong reaction to the ring. I thought it looked great on you. Where did you list it? I looked on LT and couldn't find it. Did it sell instantly again? MissyBeaucoup and Rare gem lover like this. So lovely! The contrast will look great. Haha not yet! I’ve emailed you. Hi, @Rare gem lover ! Did you mean my blue green tourmaline or the emerald green round? I got the emerald green round set in that delicate ring I showed you but haven’t had chances to take pics yet. It came out great and I am loving it! I meant the round one! Can’t wait to see it! Do share pics super soon. Which is the other blue green one? Setting for the blue one- I have one too I’m setting with trillion moissanites! Simple vertical emerald cut with a sides and super thin band. Very similar stone actually. The trillion side stones help a lot. @Rare gem lover That blue tourmaline is almost a twin to mine! I have considered trillion sidestones too, and the lady at the shop discouraged me, saying they are hard to keep clean. I don't know a thing about it, so I didn't know what to say. Maybe somebody can enlighten me. I am kind of an "easy care" person, so maybe she was just trying to simplify my life, or save me some money by steering me toward three little round diamonds set into a triangle shape. That's what I did with my pink oval spinel from Gene. I got some pics of my new green tourmaline ring today! It is cloudy out and the pics came out better than I thought they would. I am going to go post them over at the "Under $1250" page. But here's one of the two tourmalines together--the green round and blue (or blue-green) you kindly shared with me. Tourmaline comes in so many scrumptious colors! chatoyancy, Rare gem lover, 2Neezers and 4 others like this. @MissyBeaucoup I love your indicolite tourmaline, too! Do you have plans to set it anytime soon? They both look amazing! Cleaning is easy just use dish wash liquid and a soft brush. I clean my rings once a week because even stones with a super refractive index like zircon lose their glow with dust. Bluegemz and MissyBeaucoup like this. Oooh, Leslie! The color really is exceptional! I can imagine you enjoying these in lots of situations, with blue jeans, a dressy office ensemble, or out for an elegant evening. Such a pretty color and timeless setting! I hope to get it set this fall. I am saving up for some diamond baguette sidestones. Or maybe pears or trillions? I’m being a little indecisive about the setting, which is pretty normal for me. I don’t want to close the stone up because it seems to appreciate daylight. But I think the color is special and deserves a little bling.